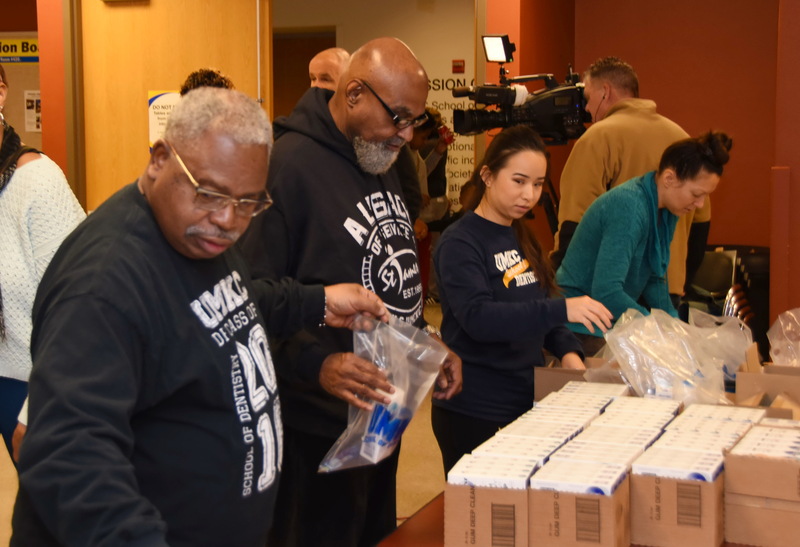 Students, faculty, staff from the School of Dentistry, UMKC and local community joined together to deliver 1,000 dental hygiene kits to local service organizations. “All of this definitely exceeded my expectations,” said Roberts, motioning with her head to the crowd of nearly 100 volunteers assembling 1,000 oral hygiene kits in the school canteen. She and about 20 other students were joined by the school’s staff and faculty including Dean Marsha Pyle and internationally recognized researcher Sarah Dallas as well as members of St. James United Methodist Church. The kits of toothbrushes and toothpaste, donated by Colgate-Palmolive, GlaxoSmithKline and Procter & Gamble, were delivered to children and adults at St. James, the Ronald McDonald House, City Union Mission, Restart Inc., American Cancer Society Hope Lodge, Hope Faith Ministries, Jackson County Family Court and the Kangaroo Food Pantry at UMKC. Roberts is part of the School of Dentistry diversity task force, which was looking for a way to honor Martin Luther King Jr. and demonstrate the core value of compassion, taking a genuine interest in the needs of those we serve in order to help them live healthy and productive lives through the services we deliver. Watch news coverage from Fox 4, WDAF-TV news. -article by Stacy Downs, UMKC MCOM. This entry was posted in Events, Feature, News. Bookmark the permalink.